Take a look at our Forms and FAQ for some commonly asked questions and forms needed for new or prospective patients. Contact us for further information or to learn more. We are located at 1801 16th Avenue, Fulton IL. Please refer to the map at the bottom of the page. You can also call The Dispensary at (815) 208-7701 or contact us. When will The Dispensary Fulton be open? The Dispensary Fulton officially opened its doors on Friday, July 1, 2016. The Dispensary’s regular hours are Monday – Saturday from 11AM to 7PM. The Dispensary Fulton is closed on Sundays. How do I get my Illinois patient card? Follow the instructions from the IL Department of Health for obtaining a medical cannabis registry card. Please take a look over our Patients’ page and the links provided above. 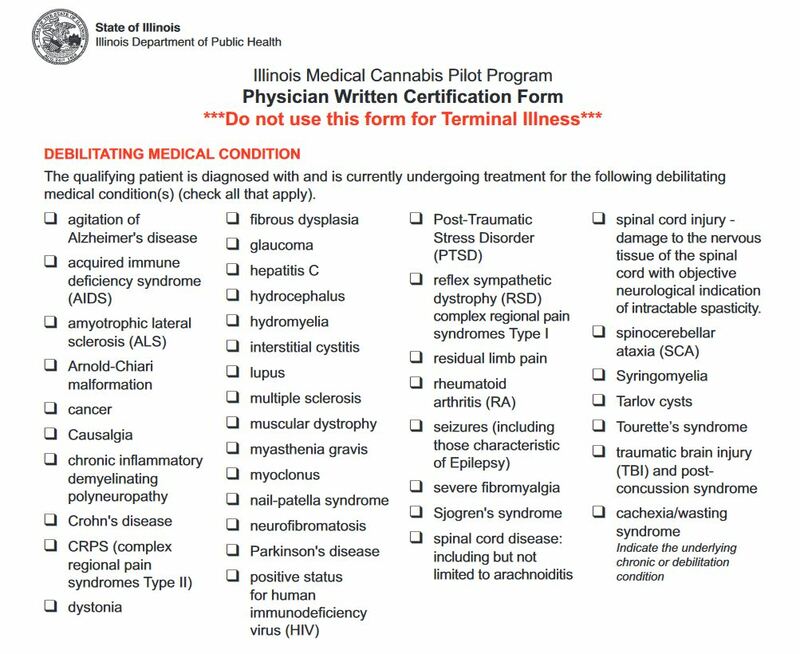 You may submit additional questions directly to the state by contacting DPH.MedicalCannabis@illinois.gov. The staff at The Dispensary are also available to field questions from patients and prospective patients via phone (815) 208-7701 or by contacting us. Additionally, we do have public access in our lobby area. Bring a government issued Illinois ID and we’d be happy to answer any of your questions in person and help assemble your application materials including the scanning of any documents, taking your picture, and even submitting your application electronically for those with limited computer and scanner access. We are here to assist. What is the difference between the MCPP and OAPP? The Medical Cannabis Pilot Program (MCPP) was the original law passed in 2014 and requires patients to have one of the 40 allowable conditions. Physicians certify the patient’s condition by filling out a Physician’s Certification Form and patients can apply online for a one, two, or three year medical cannabis card. The Opioid Alternative Pilot Program was passed in 2018 and goes live January 31st, 2019. This allows any prospective patient with an opioid prescription, or a condition that could be prescribed opioids, to receive a 90 day medical cannabis card with a physician’s approval. A Physician’s Certification Form is not required for the OAPP, but your doctor must submit their required materials through the electronic portal. Please see the Patients’ page for more information about how to sign up for both programs. My physician won't participate in the program. Where can I find a participating physician that will certify my condition? We often hear many new patients are also looking for participating physicians. To address these concerns, we have assembled a collection of participating physicians throughout the state. We have no business interest or relationships with any of these groups and are merely providing these organizations to help patients upon request. Use the Contact Us page and request more information about participating physicians throughout the state. I'm a physician who is interested in participating in the program. How can I help and where do I find more information? Check out our Physicians page for more information specifically for licensed Illinois practitioners. As a Dispensary, we have no business interest or relationships with any physician or doctor groups, as required by state law. We do however provide a list of many participating physicians across the state which we provide upon request. The Illinois Department of Financial and Professional Regulation does regulate both licensed physicians and medical cannabis dispensaries in the State of Illinois. The current program rules covering the entirety of the program can be found at the Medical Cannabis Pilot Program’s official website here. What is the list of qualifying ailments currently? The current list of ailments can be found through IDPH’s website. For simplicity, we have also included a screenshot of the current conditions covered under the program. I'm a veteran. Do I need a physician to recommend cannabis? Will you help me to register with Illinois as a patient or understand my options as a new patient? The Dispensary staff is happy to answer any questions you have regarding the Illinois medical application process and often guides prospective patients through the application process. Ultimately the patient must submit their application to the required state agencies, but we will be there to guide you every step of the way. From forms, taking your picture, scanning and uploading documents, understanding provisional access and your purchase limits, through medicating varieties, methods, dosages, to navigating the Illinois medical program and community involvement, let us know how we can help you today. I reside in a neighboring state and have one of the above ailments. Can I apply as a patient? No, only Illinois residents may apply. See the residency requirements for the Department of Public Health Rules and Regulations for Patients (DPH). What do I need to bring with me to The Dispensary? Please be advised at this time, The Dispensary is a cash only business. There is an ATM located directly across the street at the Community State Bank of Fulton or the Shell gas station if needed. You need your registry identification card issued by the state authorizing your status as a medical cannabis patient. You must also bring a government issued identification card. These two things are always required for entry to The Dispensary as mandated by state law. You must also designate The Dispensary Fulton (Located in Fulton, District 1) as your dispensary provider according to state law to purchase from our facility. To change your dispensary selection, email DPH.ChangeDispensary@Illinois.gov with your request using this Dispensary Selection Form. If you are unable to download, email, or fill out the above form, please visit our Select Your Dispensary page and fill in the requested information to become registered with The Dispensary Fulton, and we will submit it to IDPH on your behalf, or simply give us a call and we’ll be glad to help. I recently moved or changed some of my information. Do I need to tell someone? Yes, any changes in information requires you to file a Change of Information form with the department of public health which can be found at IDPH’s website under Change Your Application Information. In addition, this information must be updated with The Dispensary upon your next visit. What medicine do you currently carry? Check out our Menu to see current stock and pricing of all medicine available at The Dispensary. Always feel safe asking questions and taking your time when visiting The Dispensary. Your health is the most important, and we are always happy to discuss treatment options, specific products, or cannabis in general for those unfamiliar or new to the program and/or our facility. We encourage patients new to cannabis to schedule a private patient consultation ahead of time. Click here for more information about Private Patient Consultations. If you are familiar with the products and in a rush, you can Order Online and take advantage of the fast lane. Each patient is limited to 2.5 ounces of cannabis flowers each fourteen-day period. Exemptions to this limit are subject to doctor and department of public health approval as required by state law. Do you offer additional services to patients? The Dispensary prides itself on providing a healing environment. Additional services provided on location or within the community are occasionally offered to patients. The Dispensary also carries non-psychoactive medicines to be used as edibles, topicals, capsules, and tinctures which are derived from high CBD, low THC varieties. The Dispensary is always happy to offer educational information and other information including Illinois medical program developments and medical cannabis related activism opportunities. Can I medicate on site? No, you cannot consume your medication on site. According to state law, using medical cannabis is prohibited in a school bus, on the grounds of any preschool or primary or secondary school, in any correctional facility, in any motor vehicle, in a private residence used at any time to provide licensed child care or other similar social service care on the premises and in any public place where an individual could reasonably be expected to be observed by others. A public place includes all parts of buildings owned in a whole or in part, or leased, by the state or local unit of government. A public place does not include a private residence unless the private residence is used to provide licensed childcare, foster care or other similar social service care on the premises. Using medical cannabis is also prohibited in a healthcare facility or any other place where smoking is prohibited by the Smoke-free Illinois Act and knowingly in close physical proximity to anyone under the age of 18. I'm overwhelmed with all these products and how they might work for me. Can I schedule a time to come in and learn more about the medical options and have all my questions answered? Yes! The Dispensary Fulton offers private patient consultations. Schedule a Private Patient Consultation Today! We understand sometimes patients prefer a more private conversation without distractions to discuss their needs and medical cannabis in general. All patient consultations will include an employee-patient so they can directly speak to the benefits of certain medical products and how they may work for you. Consultations will take place in a private room directly adjacent to the sales floor with a large conference table and multimedia capabilities. While private patient consultations are available only to registered patients and caregivers, we are also more than happy to help with new patient applications in our lobby. We Will Always Give You 100% Support! Have another question?